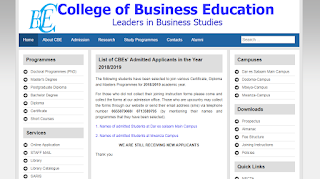 Home / NEWS / CBE: THE LIST OF STUDENTS SELECTED TO JOIN VARIOUS CERTIFICATE, DIPLOMA AND MASTERS PROGRAMMES FOR 2018/2019. 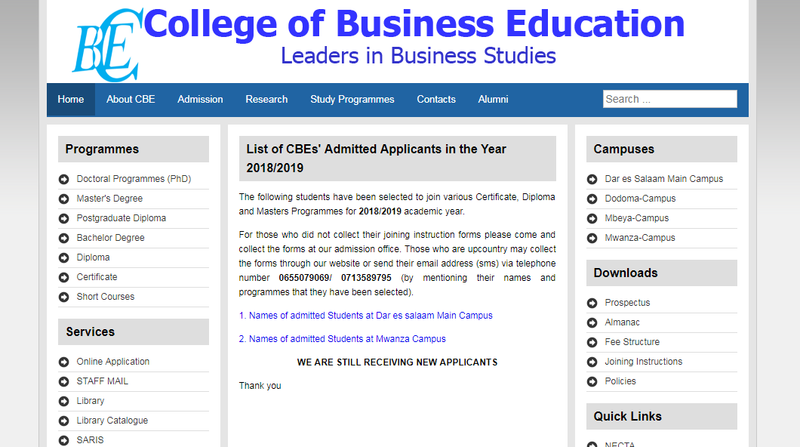 CBE: THE LIST OF STUDENTS SELECTED TO JOIN VARIOUS CERTIFICATE, DIPLOMA AND MASTERS PROGRAMMES FOR 2018/2019. The following students have been selected to join various Certificate, Diploma and Masters Programmes for 2018/2019 academic year. For those who did not collect their joining instruction forms please come and collect the forms at our admission office. Those who are upcountry may collect the forms through our website or send their email address (sms) via telephone number 0655079069/ 0713589795 (by mentioning their names and programmes that they have been selected).